(above) The Albertina Rasch Dancers in costume for Rio Rita (1927). Photographed by Alfred Cheney Johnson. Albertina Rasch (January 19, 1891 – October 2, 1967) was a naturalized American dancer and choreographer. 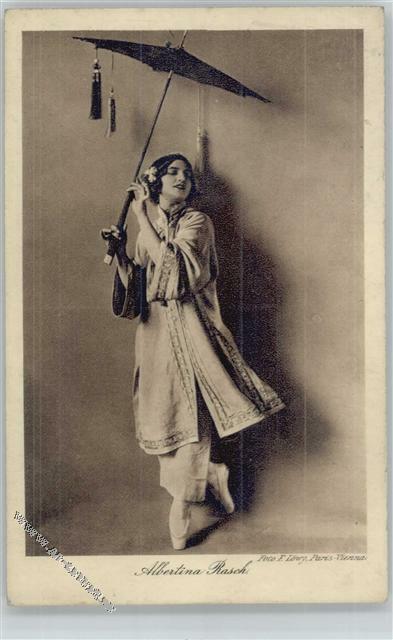 Born in Vienna in what was then Austria-Hungary in 1891 to a family of Polish Jewish descent, Rasch studied at the Vienna State Opera Ballet school and became leading ballerina at the New York Hippodrome in 1911. She formed her own dance troupe, The Albertina Rasch Girls, and the Rasch Ballet, starred in a number of Ziegfield productions. 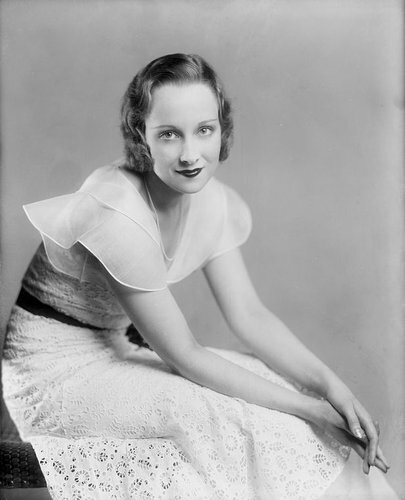 She also appeared at the Moulin Rouge, performed with Josephine Baker, toured with Sarah Bernhardt, and opened a Manhattan dance studio (where Bill Robinson taught tap) before adapting her classical training and techniques for the Broadway theatre and films. Rasch also helped establish Cole Porter’s “Begin the Beguine” as a popular standard by choreographing it to an ethnic dance in Jubilee (1935). Additional Broadway credits include The Three Musketeers, Show Girl, The Bohemian Girl, The Great Waltz, and Lady in the Dark. Rasch served as choreographer and/or dance director for a number of musical films, including The Merry Widow (1934) with Jeanette MacDonald and Maurice Chevalier, Broadway Melody of 1936 (1936) with Jack Benny and Eleanor Powell, Rosalie (1937) with Powell and Nelson Eddy, The Girl of the Golden West (1938) with MacDonald and Eddy, Marie Antoinette (1938) with Norma Shearer, and Broadway Melody of 1940 (1940) with Fred Astaire. Footage of Rasch filmed for the unfinished Metro-Goldwyn-Mayer musical The March of Time (1930) was used in the MGM film Broadway to Hollywood (1933) with Frank Morgan and Alice Brady. 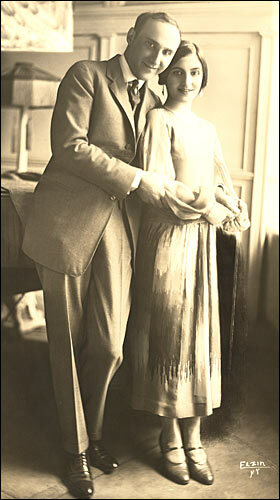 Rasch was married for many years to composer Dimitri Tiomkin (photo, left). Following a long illness, she died at age 76 in Woodland Hills, California. Dimitri Zinovievich Tiomkin sometimes transliterated as Dmitri Tiomkin) (May 10, 1894 – November 11, 1979) was a film score composer and conductor. Along with Max Steiner, Miklós Rózsa, Erich Wolfgang Korngold, and Franz Waxman, Tiomkin was one of the most productive and decorated film music writers of Hollywood. 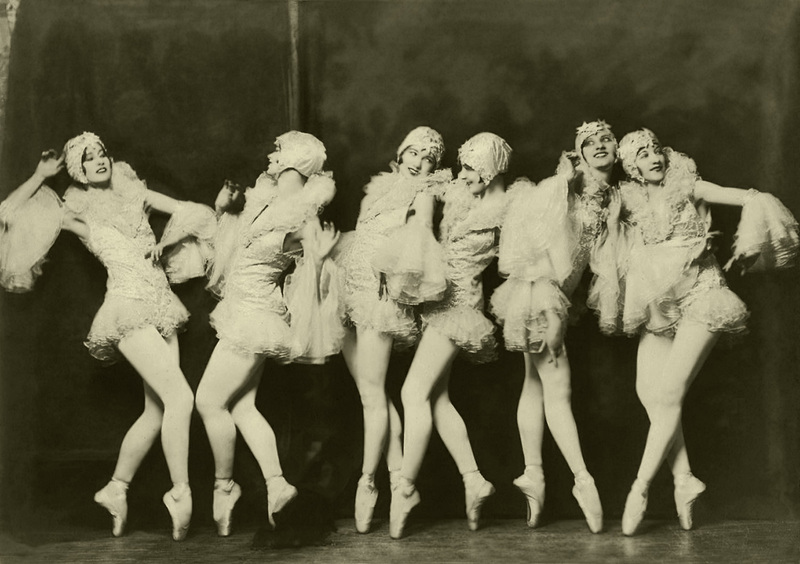 (above) The Albertina Rasch Dancers with Harriet Hoctor in the Ballet of the King number of the Ziegfeld production The Three Musketeers which opened at the Lyric Theatre on 13 Mar 1928. Photo: White Studio. Hollywood Revue of 1929 was MGM’s second feature-length musical, and one of the earliest talkies. The Albertina Rasch Ballet performs a dance staged by Sammy Lee in the production number, filmed in two-strip technicolor, for the song Orange Blossom Time (m. Gus Edwards, w. Joe Goodwin). Sung by Charles King to Myrtle McLaughlin. Dimitritiomkin.com mentions another group, the Belcher Child Dancers, performing as “pirouetting blossoms” in the number. This portion is missing; but I believe they drop from the sky on swings in the ensemble finale. There is a dissolve from about 2:26 to 2:29 (an odd interval during which a couple, previously seen walking up a flight of steps, is suddenly found standing at the bottom of them), several seconds prior to the entrance of the Albertina Rasch Ballet. Sally (1929), The Broadway Follies Ballet. On the IMDb “Soundtracks” page, The Albertina Rasch Ballet are credited with dancing to the title song of the film as it is sung by star Marilyn Miller. I haven’t found that footage yet; but I did find another clip (below) in which they dance. None of the footage I’ve seen from this film is of especially good quality. Oddly, the number danced in the following clip is uncredited by IMDb. It is, however, mentioned by an IMDb user reviewer, lugonian, who also credits the Rasch Ballet with performing an unnamed “Russian dance number” in the film. The Rasch Ballet is also credited by IMDb with performing with Marilyn Miller in the number Wild Rose in Sally. They are certainly not in the clip available at Youtube of the number. Rather, Miller dances and sings with a long chorus line of male dancers in tuxes (also available in my page “1920 selected standards and hits“). The provider of the video below identifies the number as The Broadway Follies Ballet. The Rasch Ballet dance for nearly five minutes before Marilyn Miller ascends through a trap door in a platform to begin her part of the number. Why Bring That Up? This 1929 film stars Moran and Mack, a blackface comedy act popular in the 1920s and 30s. The Albertina Rasch Dancers evidently danced in one of two musical numbers listed in the soundtracks for the film (by IMDb), Do I Know What I’m Doing While I’m in Love, and Shoo Shoo Boogie Boo. 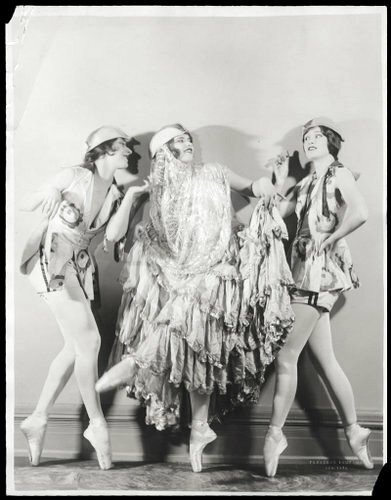 I haven’t found a clip yet; but do have a few photos of some the Rasch Dancers in star-studded costumes, reportedly taken during production of the film (from Historical Ziegfeld Group). (above) Dimitri Tiomkin plays piano surrounded by the Albertina Rasch Dancers on the beach in Santa Monica. According to the caption at Historical Ziegfeld Group, they are in rehearsal for their role in the film Devil-May-Care (1929). The following short clip is, according to the youtube provider, from that film. It seems more like a portion of number or perhaps a transitional piece rather than an entire number, though there is applause at the end suggesting that the clip runs to the completion. Neither the title of the piece nor the identity of the dancers is given by the provider. The only number credited to the Albertina Rasch Ballet by IMDb for this film is Love Ballet, music by Dimitri Tiomkin. Few balletic skills are in evidence here. 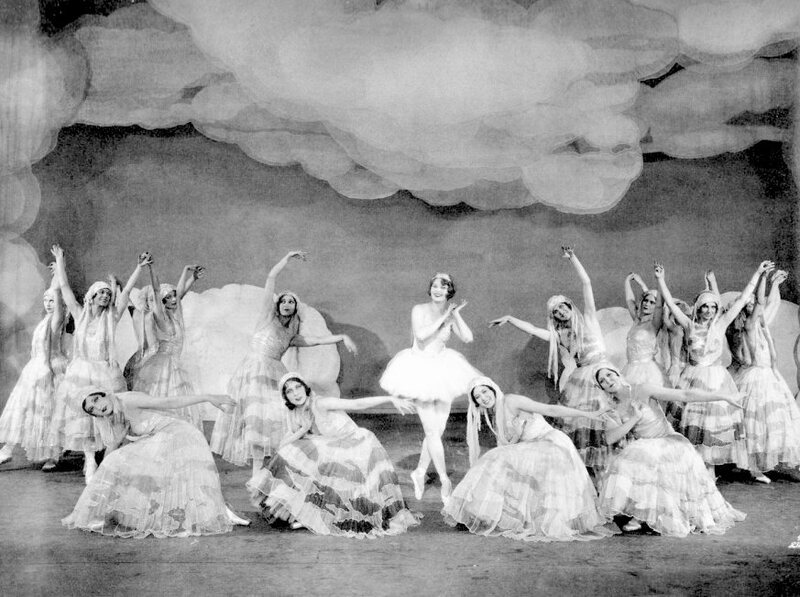 “The Swan Ballet” from the MGM film The Rogue Song (1930) directed by Lionel Barrymore. In Technicolor. The music is listed at IMDb (Internet Movie Database) as Ballet Music (Suite Choreographique), composed by Dimitri Tiomkin (uncredited). 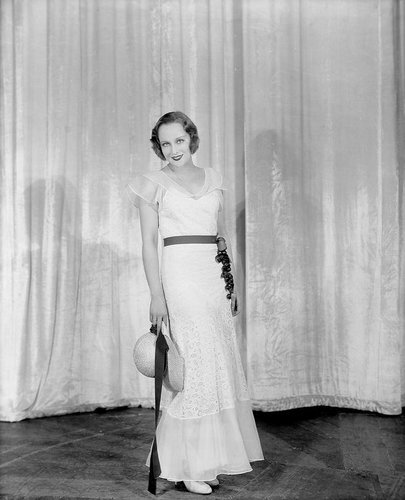 Albertina Rasch is credited as the dance director. 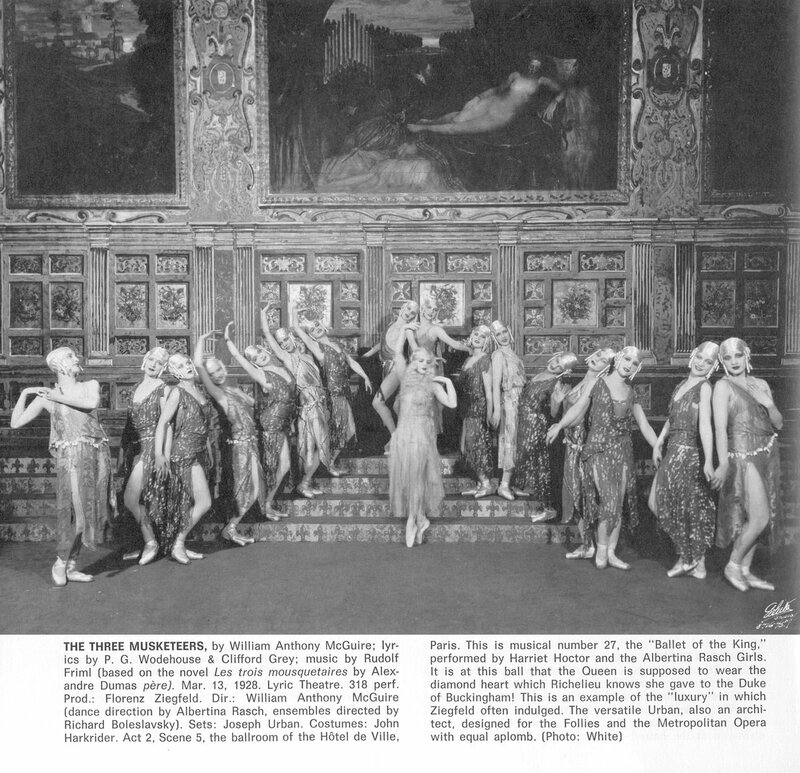 (Below) The Albertina Rasch Ballet perform “The Hades Ballet” from the abandoned film The March of Time, a planned Metro-Goldwyn-Mayer musical film originally scheduled to be released in September 1930. Production of the film, which would have been one of the first musicals filmed in two-color Technicolor, was abandoned, although a number of musical numbers were filmed. Harry Rapf, producer of MGM’s Hollywood Revue of 1929 planned a follow-up film, to be called Hollywood Revue of 1930, which eventually became The March of Time. Some footage from The March of Time later found its way into other pictures. (Below) In this clip there are two additional brief fragments of dance numbers from The March of Time involving the Rasch Ballet. I don’t have the titles or other pertinent information at this time. A possibly complete number from The March of Time, called A Girl and a Fan and a Fellow, did not involve the Rasch Ballet. (Below) “Blue Daughter of Heaven” from the 1930 film Lord Byron of Broadway directed by Harry Beaumont and William Nigh. Music by Dimitri Tiomkin and lyrics by Ray Egan. The vocalist is James Burroughs. Dance by the Albertina Rasch Ballet. Rasch is credited as the “stager” for the ballet. Overhead shots of circular portions of this dance sequence, hinting at later developments by Busby Berkeley, were filmed a year before Berkeley himself ever worked on a film. The sequence was reused in the short film Roast Beef and Movies (1934) featuring Curly Howard (of the Three Stooges). IMDb also says the Albertina Rasch dancers appeared in the 1933 short film Plane Nuts starring Ted Healey and His Stooges. However, it appears that the dance numbers from that short were basically constructed around Busby Berkeley choreographed sequences from the film Flying High (1931). The two numbers in question are I’ll Make a Happy Landing and We’ll Dance Until the Dawn, both built upon songs by the team of Jimmy McHugh and Dorothy Fields. I have the clips, but it is uncertain whether the Rasch girls were used in the choruses. None of their balletic skills are evident in these numbers. Furthermore, I haven’t yet found a single site which connects them with the film Flying High (except IMDb’s credit on Plane Nuts) or any Berkeley production. Appearances by the Rasch Girls in two other early films, Pointed Heels (1929) and Crazy House (1930), are noted by IMDb. Clips from these films (nearly all of Pointed Heels) are available at youtube. But in each case the portion containing the dance number by the Rasch dancers has been removed! Although apparently uncredited, and not even mentioned by IMDb, the Albertina Rasch Ballet dance with Eleanor Powell during a dream ballet sequence, staged by Albertina Rasch, which amounts to about half of the six minute long production number for You Are My Lucky Star. “You Are My Lucky Star” is conceived as a dream ballet, giving Powell a rare film opportunty to show off her early training in ballet. The number begins with Powell (dubbed by Marjorie Lane) singing the song in an empty theater and imagining herself the star of a production that also features the Albertina Rasch Ballet. The ballerinas reportedly were forced to remain on point for such long periods during filming that blood was seeping through their slippers. Between takes they took off their shoes and put on [sic] ice on their feet — although Powell refused to do this because she feared she wouldn’t be able to force her swollen feet back into their slippers. 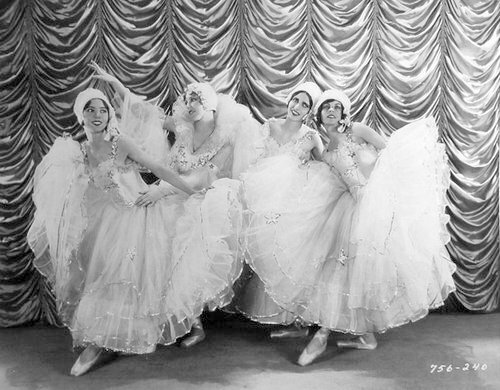 According to Powell biographer Margie Schultz, the dancer lost four toenails on her right foot during the filming. The song “You Are My Lucky Star” (m. Macio Herb Brown, w. Arthur Freed) is a motif which recurs several times throughout the film. Here it is sung (dubbed by Marjorie Lane*) by Eleanor Powell at the opening of this scene. 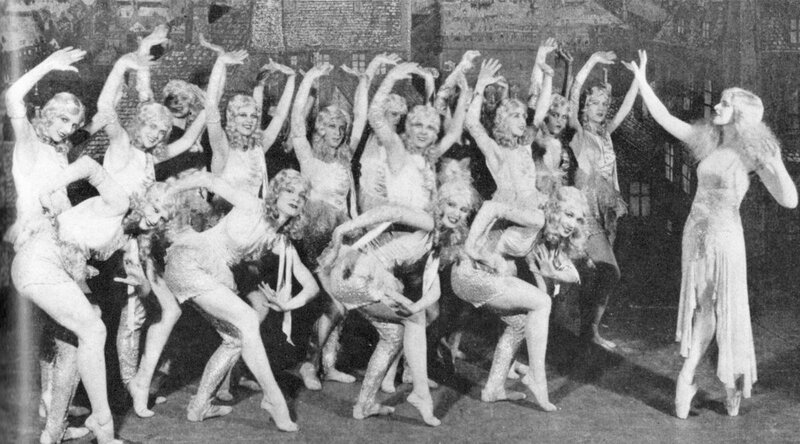 Then, in a sequence imagined by her character, a male chorus serenades her with the song as Powell begins to dance among them. This continues for about 40 seconds; then, the camera moves up and away, toward the rear, until it comes upon a ballet performance, danced by Powell and the Albertina Rasch Ballet. * While IMDb credits only Marjorie Lane for vocal dubbing on this song, the book Award-Winning Films of the 1930s, by John Howard Reid, pub. 2004, credits both Lane and Frances Langford. Hi Billie Ray, I’m not familiar with the name. 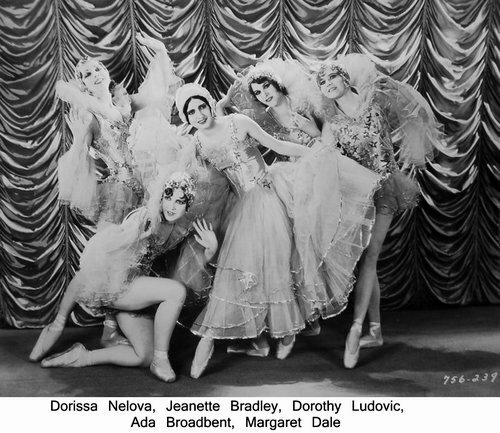 Nor did I find it in Google searches on “Ethel Eddie Belmont,” “Ethel Eddie,” or “Ethel Belmont.” I haven’t found many photos of Albertina Rasch Dancers or Rasch Ballet members in which the girls are identified by name. I’ve posted one or two and there several more at the site Historical Ziegfeld Group (http://ziegfeldgrrl.multiply.com/). 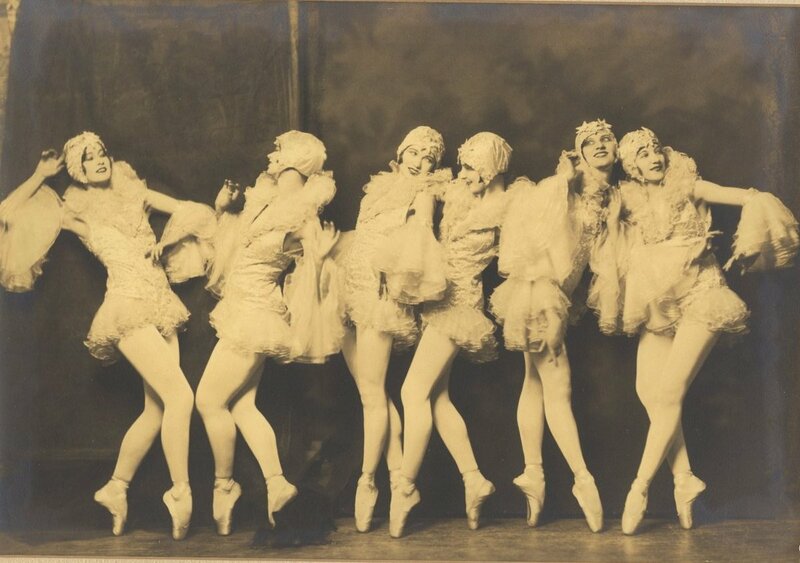 They’ve a number of pics of the Rasch Dancers and Rasch Ballet taken during production of various Ziegfeld productions. I might be interested some time. Kind of busy with other projects right now. I think from time to time about expanding that page and one of the ideas is to focus on individual dancers. However, I don’t know many of their names. A couple of times I’ve made brief attempts to find more info and pics on the few names I do have, without any success. This time you’ve changed the name to “Eddie Belmount.” I’ve just done a Google search and found not a single result on that name. Are you pulling my leg? Looking for information about a dancer known as Phylis H. Sequeira, of the Albertina Rasch Dance company of New York? She was born Nov 1908 in Boston, MA to a Faculty Music Teacher at the New England Conservatory of Music and Bertha Denee, a French Canadian. 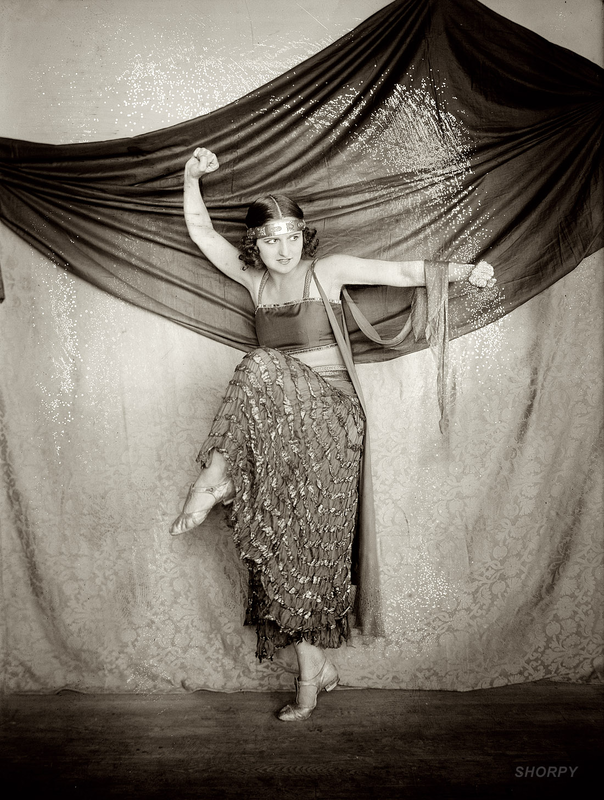 She was billed as the Star Dancer when the company was touring in New Orleans, LA in 1927. She is a daughter of my Grandfather, David Sequeira, a concert pianist and composer. Any photos of her or other information about her would be appreciated. Thank you. Jean, Hi. I haven’t been able to locate anything on Phylis Sequeira or on Bertha Denee in brief searches. Did find a couple of articles referring to your grandfather David Sequeira though. I presume you’ve got the spelling correct, one “l” in Phylis, not two as is more common. Maybe she used a stage name, possibly Helen?